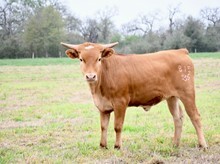 SHES QUITE A LADY, AND HAS RAISED 2 GREAT HEIFERS. REALLY LOVE THE BALANCED BODY ON THIS HEIFER AND HER PEDIGREE IS WHY WE BOUGHT HER. HARD TO BEAT. HER MOM IS A BEAUTIFUL TRI COLORED COW.